Eye Movement Desensitization and Reprocessing (EMDR) is a unique and powerful therapy for helping people deal with stress, trauma, painful memories and places in their lives where they are stuck. EMDR specifically targets traumas that have been “locked” in the brain, but can also be used for events that are not considered trauma in the traditional sense, such as ongoing teasing while in school, chronic childhood illness, etc. After experiencing a traumatic or stressful situation, negative thoughts and beliefs about the self can dominate. Generally, these are the feelings of not being good enough, not being safe, or not being in control. These beliefs of inadequacy, helplessness, or powerless can contribute to patterns of depression and anxiety, impacting most areas of your life. Negative feelings can also become stuck leading you to experience the negative feelings in the present even though they’re connected to the past. These feelings can impact your view of current situations, which may feel “true.” Negative sensations associated with those feelings also surface and you may try to “avoid” experiencing them. Over time, these experiences can build up and lead to depression, anxiety, or PTSD. 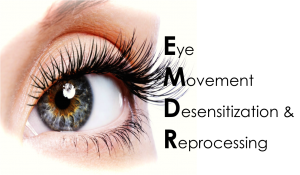 EMDR is an innovative form of treatment discovered by psychotherapist Francine Shapiro in 1987. She discovered that rapidly moving the eyes back and forth (similar to what occurs during the REM phase of sleep) while processing a negative event helps a person become less upset and helps them better work through their difficulties. Since then, it has been further developed into a highly specialized form of therapy. Part of what makes EMDR so effective is that it does not just address your thoughts and feelings, as regular psychotherapy does, but creates a mind-body connection. This is achieved by assisting you in combining your memories with how your body feels, what emotions you may have, what negative thoughts come up for you, and what sensations you experience in your body as you remember these past experiences. EMDR works by both de-sensitizing you to past experiences, so that old memories no longer seem so upsetting and by helping you move towards closure as you begin to think about your past in a new way. EMDR a trauma treatment that has been empirically validated in over 24 randomized studies with trauma victims. Substantial scientific research has established EMDR as effective for treating posttraumatic stress. It has been effective in treating trauma, PTSD, sexual and/or physical abuse, and disturbing memories, as well as phobias, panic attacks, performance anxiety, complicated grief, and stress reduction. Before beginning EMDR, Dr. Barbash will teach you coping skills and strategies to feel safe and grounded, increase your resiliency, and help you learn to self-regulate your emotions. Once you’re prepared, you’ll identify negative feelings and beliefs that you may have developed as a result of the trauma you experienced. For example, you may hold a belief that you are unlovable, experience disturbing thoughts or images, or feel uncomfortable physical sensations in your body. The EMDR process helps you to release the impact of trauma from your mind and body so that you can feel stronger, safer, and more secure. Will I Have to Revisit Painful Memories or Experiences? Many people who have experienced any form of trauma develop a very normal way of coping by blocking out or repressing particularly painful memories. Unfortunately, over time, these memories may rise to the surface in disturbing ways. EMDR seeks to help you relieve the disturbance resulting from traumatic experiences. One way this is accomplished is by briefly recalling a vivid memory while engaging in EMDR processing via eye movements or taps. This process continues until there is no distress when recalling the memory. You don’t have to discuss the details and for many, this treatment is equally effective to PE without reliving the experience. * It is not always necessary to dig up buried memories to start the process of healing. Furthermore, the goal of EMDR therapy is to reduce the disturbance of painful memories. You will be guided safely through a process of healing at a pace that feels safe and comfortable for you. What if I Don’t Remember Any Specific Trauma? You don’t need to recall a specific incident for EMDR to be effective. If you resonate with the symptoms of trauma, you can begin by exploring your history to identify a particular feeling that stands out to you the most. From there, what needs to surface and process may emerge and Dr. Barbash will guide you through anything that might be stuck. Each person processes trauma in a different way. Initially, Dr. Barbash will guide you in building resources to prepare you for the EMDR phase of therapy. Once beginning the process, you may begin to notice shifts within 3-5 sessions. Some clients achieve their goals within 8-12 sessions and for those with complex or developmental trauma, it may be longer. EMDR works best when used in conjunction with traditional therapy so you may want additional therapy sessions to process and integrate your experience. If you’re in search of a Therapist in Tampa that can assist with EMDR Therapy Dr. Barbash of Tampa Therapy has advanced training in the treatment. She will work with you to identify your specific concerns and problem areas, and collaboratively develop a treatment plan that best fits your needs.